If you and your homeschool group would like to schedule a group educational program, please click on the button below. Local scientists and environmental educators are collaborating to bring a unique learning experience to area homeschool students. Seven agencies and organizations will host a weekly immersion series known as the Homeschool Hopper: Starting a Riverlution. This interactive series will focus on watersheds, aquatic habitats, and human impacts to water quality. 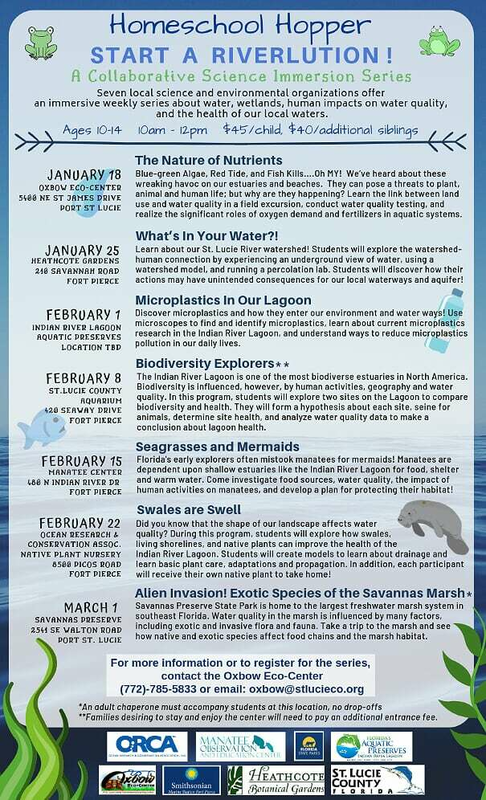 The weekly hands-on sessions include biodiversity studies, investigations into microplastics, water quality testing, propagating living shorelines, and more! The sessions will take place on Fridays, 10am-Noon, starting January 18th at the Oxbow Eco-Center and running through March 1st at Savannas Preserve State Park. Each week, students will visit a different venue, learning from a diverse group of scientists and educators. The course is appropriate for ages 10-14. Cost for the 7-part series is $45 per student; $40 for each additional sibling. 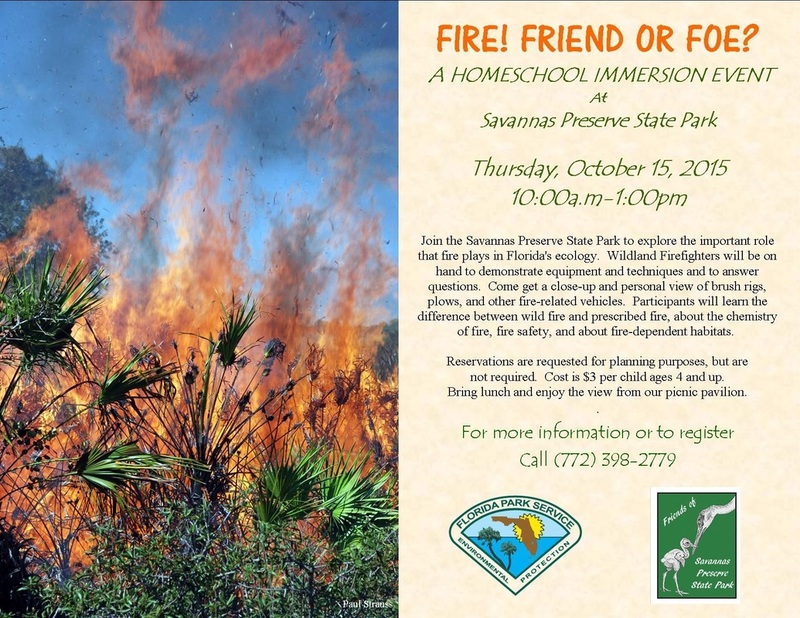 For more information, please contact Savannas Preserve State Park (772) 398-2779. To register and pay, login to our Online Store at https://squareup.com/store/friends-of-savannas/ . 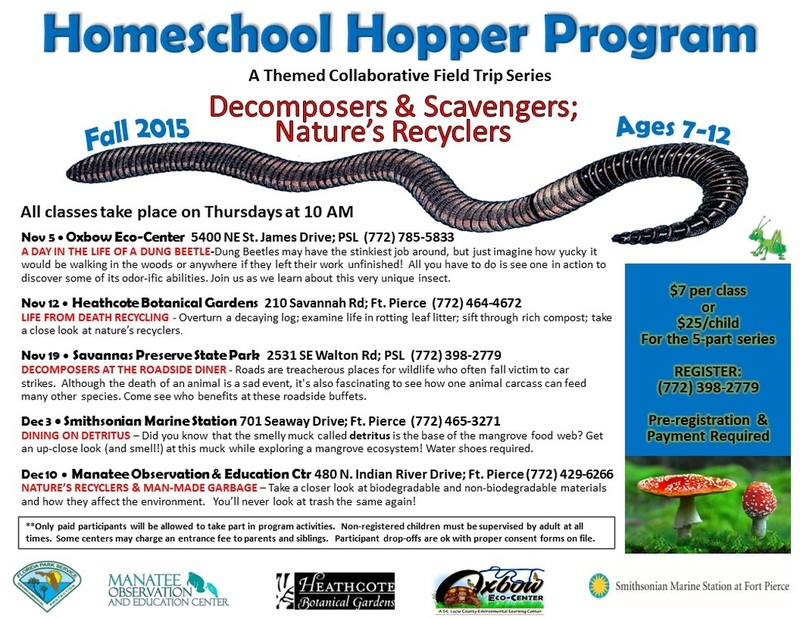 The Homeschool Hopper program began in 2014. Designed to teach a comprehensive science unit through immersion and hands-on experiential learning, it has been a popular opportunity for area homeschool families. This 2019 series, Starting a Riverlution, is sure to exceed expectations with a record seven participating organizations. These include the Oxbow Eco-Center, Smithsonian Marine Station, Heathcote Botanical Gardens, Savannas Preserve State Park, Manatee Center Observation & Education Center, and our two new partners, Indian River Lagoon Aquatic Preserves, and Ocean Research & Conservation Association (ORCA). “The Homeschool Hopper is one of my favorite projects each year,” said Wren Underwood, Senior Environmental Educator at the Oxbow Eco-Center. “Instead of a one-time visit for participants, this program allows students to gain a deeper, more meaningful understanding of the topic at hand. In this case, that topic is water and why our area is suffering from algal blooms and fish kills. It’s a timely and important topic.” Homeschool families interested in understanding current threats to our aquatic ecosystems and working toward solutions should contact Savannas Preserve State Park to get involved. Youth Etiquette Classes:​ Homeschool students ages 8 and up are invited to attend Youth Etiquette Classes offered by Dr. Barrett of Speaking Hands. This 12-week course will be held on Thursdays from 12:00 p.m. to 2:00 p.m. March 8-May 24, 2018. Classes will be taught at the Savannas Preserve State Park Education Center located at 2541 SE Walton Road, Port St. Lucie. Pre-registration is required by calling 772-398-2779. Class size is limited so register today! Each class is $25, which includes the State Park Admission Fee. Minimum age for participation is 8 years old. Sign Language Classes: Learn to speak Sign Language in this all-ages 12-week course! Classes will be held every Thursday from 2:00 p.m. to 3:00 p.m., March 8-May 24, 2018, at the Savannas Preserve State Park Education Center located at 2541 SE Walton Road, Port St Lucie. The course will be taught by Dr. Barrett of Speaking Hands. Pre-registration is required by calling 772-398-2779. Class size is limited so register today! Each class is $12, which includes the State Park Admission Fee. Minimum age for participation is 8 years old. Homeschool families are invited to delve into nature journaling in this creative, hands-on mini-event for ages 7 and up. Younger children are welcome with parental assistance. Participants will make a nature journal, then rotate through stations to learn how to draw wildlife, identify plants using leaf shape, create art using pressed flowers and leaves, and write nature poetry. Contemplation walks are also planned. Reservations can be made through (772) 398-2779.